Elizabeth Magok went on dozens and dozens of job interviews. But she never got a call back. 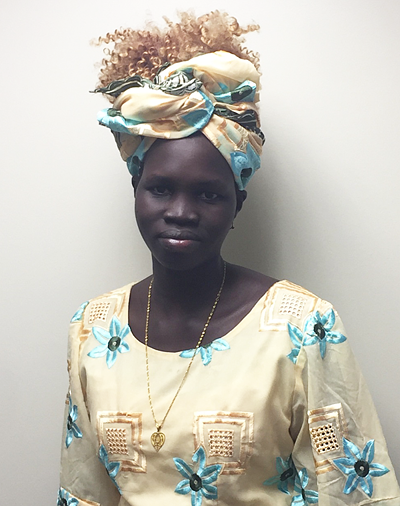 Elizabeth, now 30 years old, grew up in South Sudan and came to the U.S. as a refugee five years ago. To support her four children and send money to family back home, she took minimum-wage jobs in food service, hospitality, and retail. But the language barrier prevented her from finding a higher-paying job. “When I came here, it was really hard for me to understand,” she says. Elizabeth speaks softly, and though her English has improved tremendously, you have to lean forward to catch her quiet, melodious voice. To achieve her dream of becoming a nurse, Elizabeth knew education was key. She went to Des Moines Area Coummunity College (DMACC) to ask about earning her high school equivalency degree, but at the time, the college didn’t offer classes on the subject matter or support English Language Learners. Studying was self-directed—an impossible task for someone who only spoke Dinka. When Elizabeth checked back this fall, DMACC and United Way of Central Iowa had launched Bridges to Success, a program to help 10,000 central Iowans earn their high school equivalency diploma (HSED)—what used to be called the GED—by the year 2020. "Because I love my school and my teachers and I love United Way, I try my best in class." Elizabeth is working toward her high school equivalency diploma (HSED) so that she can go on to become a nurse. Bridges to Success is helping 10,000 central Iowans earn their high school equivalency by the year 2020. Bridges to Success offers free classes, books, and testing. Elizabeth jumped into school with excitement. By November, she had already taken the math class and passed that subject test, one of five needed to pass the HiSET exam, which is required to earn an equivalency diploma. Elizabeth is currently enrolled in the English Language Learner (ELL) Foundations class to acquire background knowledge and improve her English before moving on to other subjects like reading and social studies. Each day, Elizabeth is closer to her dream of becoming an RN. But Bridges is unique in using two strategies: promoting long-term career goals and facilitating short-term improvements like getting a better job, finding reliable transportation, and overcoming personal challenges. The career coaches, one of the most instrumental and popular features of the Bridges program, live at this intersection of the long and short term. For Elizabeth, who had been searching for a job for months, her career coach, Caryn Kelly, made the difference. Caryn was able to crack the case of the missing phone calls: Elizabeth didn’t speak confidently enough. This was not a character flaw but a cultural behavior. In South Sudan, you show respect to superiors—such as a potential employer—by looking down, speaking softly, and not bragging. Caryn explained that job interviews in America required confidence and eye contact. Nevertheless, Elizabeth was willing to give it a try. Caryn sent her sample job interviews to watch and encouraged her to practice in front of a mirror. She soon had two phone calls—and two job offers. Elizabeth now works at Optimae Life Services, which provides health care and human services for individuals with disabilities and mental illness. She always thought she would have to wait until finishing her degree before working in health care. “Now I can say I started to be a nurse today,” Elizabeth says proudly. Part of her job is handing out medication to clients. Despite this victory, life is still a struggle for Elizabeth and her family. They can’t afford child care for their four kids, so Elizabeth watches them while her husband is working; he takes over when she is at work or school. But her dedication to her dream—becoming a nurse, providing a better life for her family—never falters, even in the face of sleep deprivation. She often cuts down on sleep to fit in study time. She is helped along by teachers who patiently answer questions and explain vocabulary and by her career coach—her own personal advisor and cheerleader. “I got the job because of her,” Elizabeth says. In addition to helping with the application and coaching her on interview etiquette, Caryn served as a reference for Elizabeth. “She said everything good about me,” Elizabeth says with a laugh and proud smile. “Elizabeth is one of the most dedicated students I’ve ever worked with,” Caryn says, repeating those same praises. “It’s been a pleasure to watch her confidence grow throughout the semester and see her transform from someone who couldn’t get a job to someone who had two jobs to choose from!" Elizabeth is proud of making those strides, but she is quick to share the credit with the Bridges to Success staff.